In-Room Multi-Purpose Sharps Container has a mailbox style lid that stays closed when the container is not in use. In-Room Multi-Purpose Sharps Containers lock and secure for safe disposal. These economical In-Room Multi-Purpose Sharps Containers provide a handy horizontal drop to maximize the container’s volume. 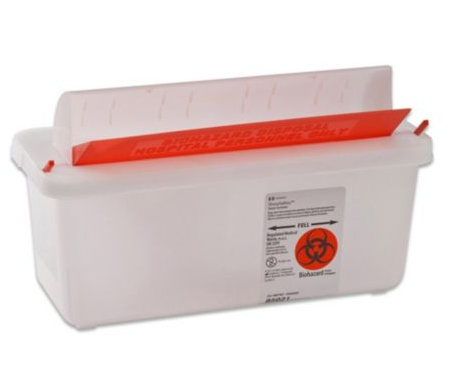 Manufactured by Kendall, the In-Room Multi-Purpose Sharps Container is made of plastic and is available in translucent or red color base. The Kendall In-Room Multi-Purpose Sharps Containers come in 2 quart, 5 quart or 3 gallon volume sizes. Mailbox style lid that stays closed when the sharp container is not in use. Horizontal drop maximizes use of the sharp container’s volume. Sharps container locks for sake disposal of medical sharps. In-Room styled sharps container adaptable to individual needs. 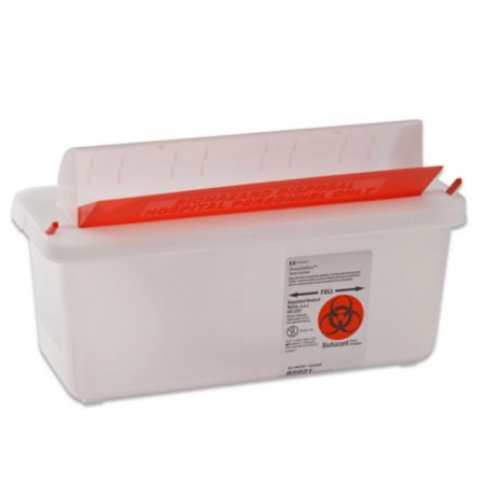 Kendall In-Room Multi-Purpose Sharps Container Product Numbers: 85021, 85131, 85121, 85221R, 85131. Width Options: 10.75 Inch or 13.75 Inch. Depth Options: 4.75 Inch or 6 Inch. Color Options: Red or Translucent. Lid Type: Horizontal Entry Lid. The current photo shows a large (about 2 gallon) Covidien sharps container with an "Always Open Lid", which isn't what you will get if you purchase this product. I bought based on the photo and was very disappointed. This website sells good products at a low price, but their photos are horribly inaccurate. Before you purchase, take time to do your homework and look up the model number on another website for accurate information! You can get more in these sharps containers. Price is good too.